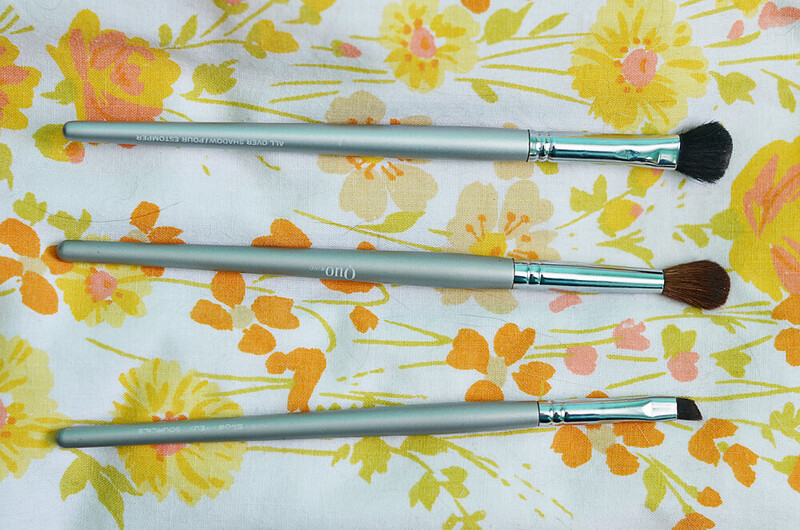 49/365 :: My makeup brushes. I took a photo of them but didn't end up sharing it in my makeup post. 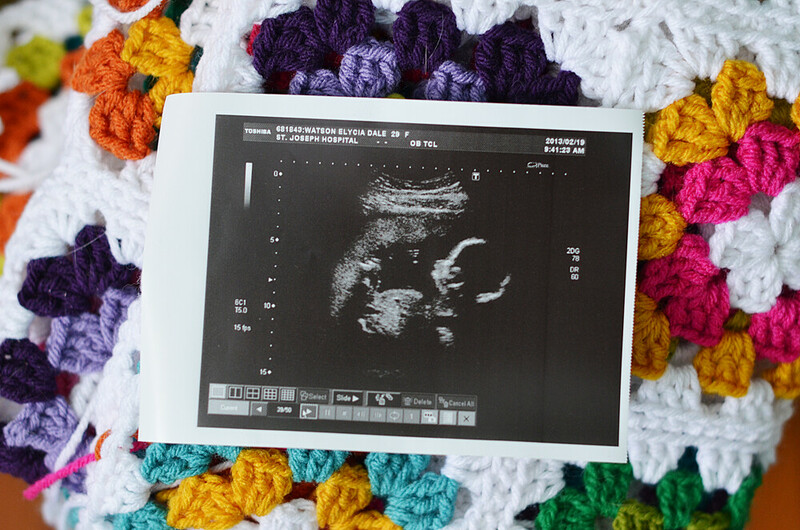 50/365 :: Yeah, yeah, the ultrasound photo again. But look, it's on a different background. 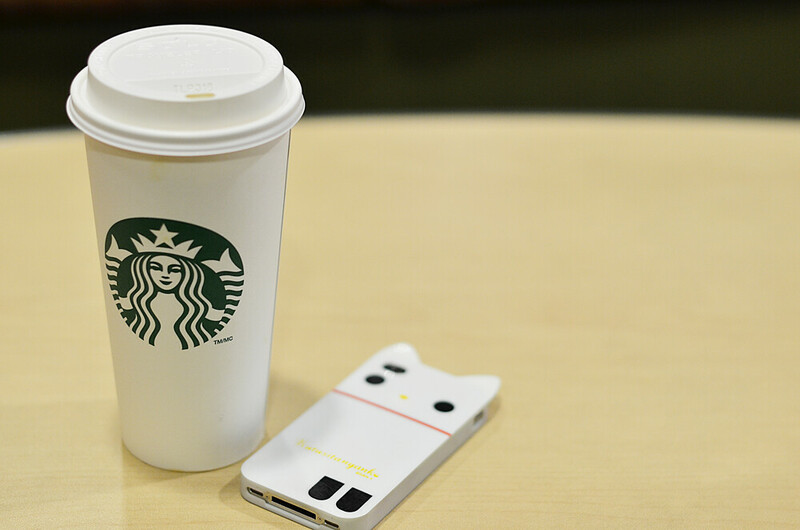 51/365 :: Special treat...a decaf soy latte. Yum. 52/365 :: Pretty soap at Lush. I picked up some new shampoo and conditioner while I was there the other day. I have only used the conditioner once so far but I love it! 53/365 :: A sleepy, snoozy Pinny. 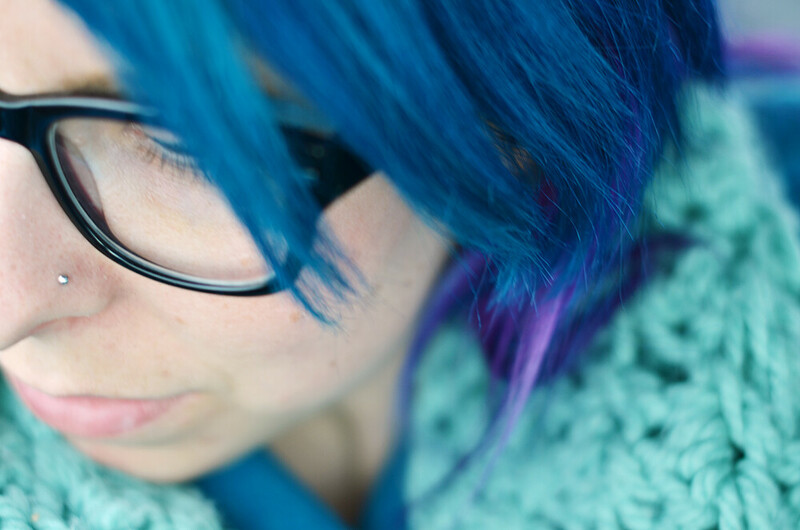 54/365 :: A new colour showed up on my head Tuesday afternoon to celebrate a little boy. I haven't been bleaching but I have been adding a bit of colour here and there. 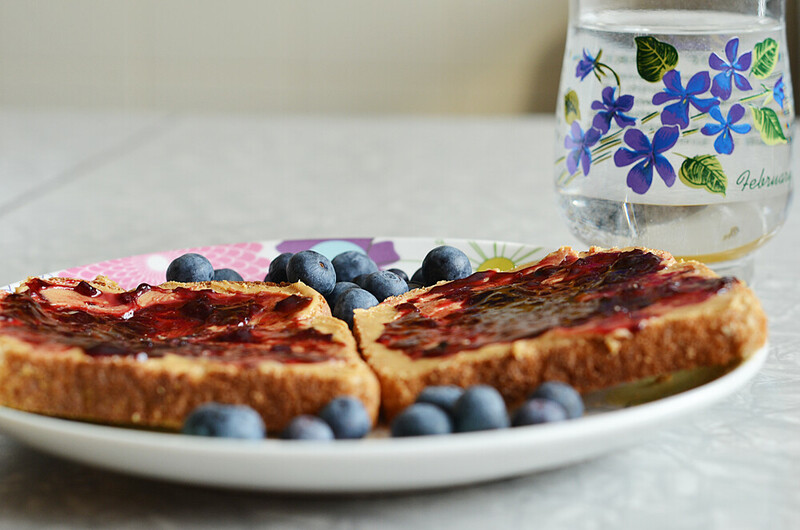 55/365 :: Breakfast of champions. We were out of bread and I absolutely needed some toast with peanut butter and jam for breakfast so I went out bright and early to get some. Oh yeah, and I'm using my February glass because, duh, it's February. I hope everyone has a great Monday. Maybe today I actually will get around to responding to all of my email like I said I would last week. Haha! I'm cracking up over here, we essentially switched hair colors! You went blue and I went pink/purple. I started laughing when I saw the other day you posted that you changed from blue. I was wondering what you went to! If your hair is feeling pretty damaged from the bleach you have used, you should try this Paul Mitchell product called Forever Blonde. It has worked wonders on my hair. Ive been bleaching mine for about two years now and I was starting to feel the effects recently when I had a hair disaster. I started using this product and after a month, it has brought my hair back to life. I've been using it for two months now and I can't believe how amazing my hair looks considering this past December it looked so dead. Beautiful! 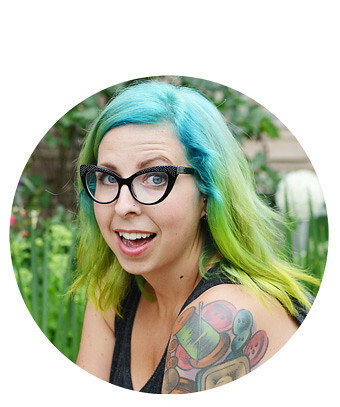 I want colorful hair, but I'm job hunting, so unfortunately, people don't generally like colorful hair in the office world. Aww sleepy kitties are my favorite! Congratulations on the baby! So happy for you! Great, fun photos! 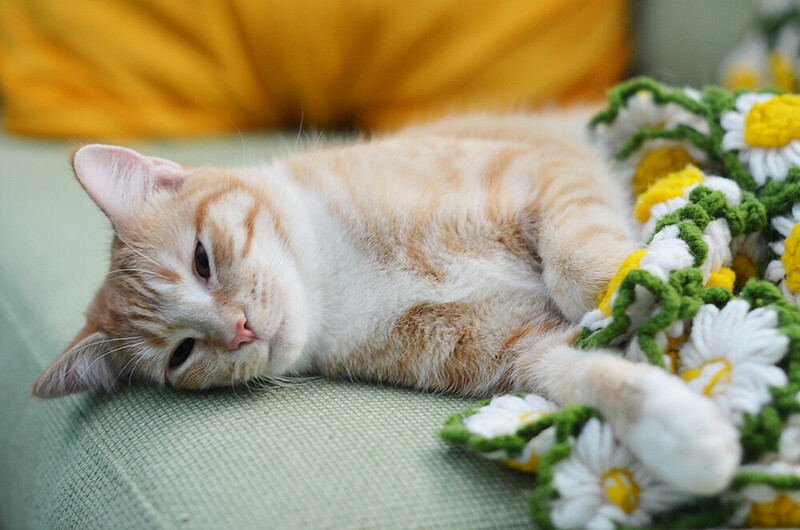 I've been reading your blog for ages (over a year I think) and never commented which is silly, but I wa wondering if you could share the pattern (or where to buy/find it) for the gorgeous daisy blanket that Pinny is snoozing under? I didn't make that pretty blanket so I don't have a pattern! I'm sorry! That one was a thrift find. Congratulations with the baby!! 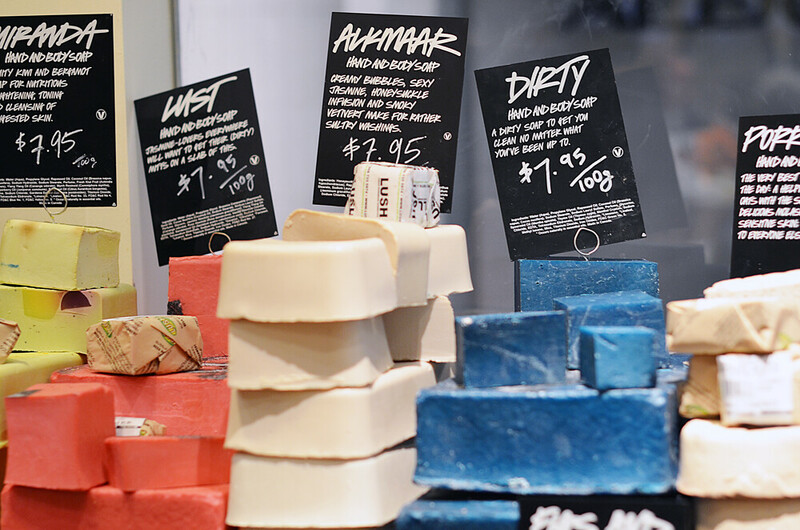 Oh, I've been working at Lush here in Norway for 2,5 years, and of course I looove the products! Which shampoo and conditioner did you get? My hair used to be all damaged and frizzy, but after Lush haircare; no more:-D We don't have the Alkmaar soap here. It looks so nice and creamy! I got the Blousey shampoo and Veganese conditioner. The shampoo doesn't foam at all which I thought would freak me out but I actually love it.